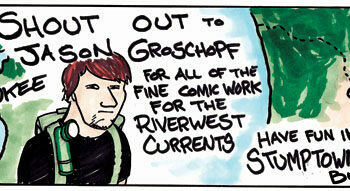 Jason Groschopf is moving to Portland and we will miss our comics guru. comic by Coth. Riverwest Artist Jesse Graves, who lives in Riverwest, is one of the lead artists for the IN:SITE project. He has a BFA from the University of Wisconsin-Milwaukee, and is currentlly student teaching.